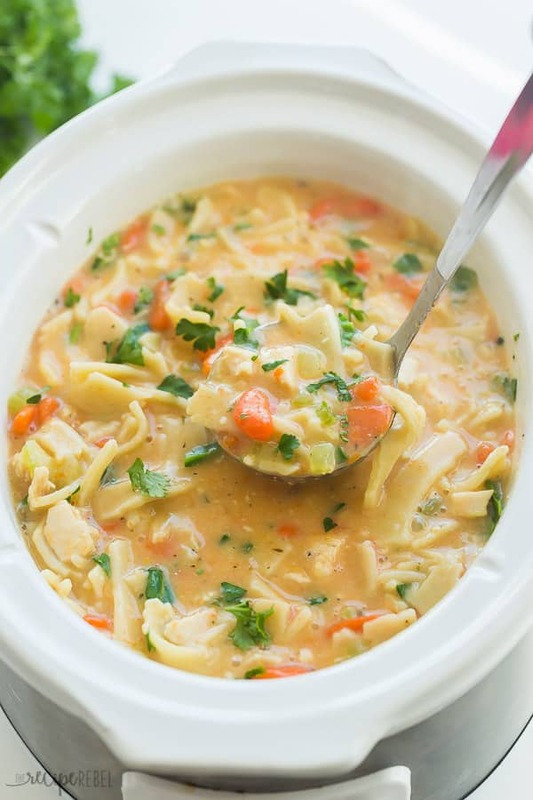 This Slow Cooker Creamy Chicken Noodle Soup is so easy to make and BIG on flavor! A hearty crockpot meal that is sure to please! I don’t really know why. Maybe because of how well all the flavors blend together after being simmered together for so long. Or maybe because I can hide all the vegetables I want in it and that just adds to the flavour. Or maybe because I also really like fresh bread. And there is nothing like fresh homemade bread with a good bowl of soup to dunk it in. I also love my slow cooker. We will buy a case of whole chickens, 12 at a time, and keep them in the freezer. There is almost nothing better to come home to after a day at work than I slow-cooked chicken. And one of my favorite things to do with the leftovers is make soup. If you can, I highly recommend slow cooking a whole chicken in the crock pot to make your chicken broth for this soup — the flavor is unbeatable! (a) Homemade Chicken Noodle Soup rocks. (b) It means I don’t have to clean the slow cooker for at least another 24 hours. Because I leave the carcass in to make the broth overnight, and then strain it and add the veggies in the morning. And I’m all about avoiding washing dishes. I honestly don’t know if I’d ever made a creamy chicken noodle soup before. Which is strange, because I like most food thick, and rich, and creamy. I had seen a lot of recipes for creamy chicken noodle soup, and I was intrigued. I figured it would be super easy to whisk up some milk and flour, and add it in at the end to get a nice thick, creamy soup, so I started looking around to see how others had done it. I found a lot of recipes just added straight cream at the end. And others melted butter, made a roux, and thickened milk that way before adding it. I knew I wanted my soup much thicker than it would be if I just added straight cream or milk, and I also knew I didn’t want to go through all the effort of making a roux and thickening milk (don’t get me wrong — that’s normally how I would do it!). So I decided to try whisking up some milk and flour, and see what kind of texture I could achieve like that. The answer? The perfect thick, rich, creamy texture with minimal effort. Also, it’s made in one pot, and that pot is your slow cooker or crockpot. Which makes it perfect for busy days when you still want to eat real food. If you want to thicken soup without using flour, you can mix up a corn starch slurry and add it to the soup while it is very hot. It will take a few minutes to thicken completely. 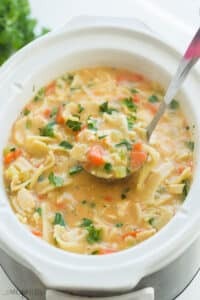 The easiest Slow Cooker Creamy Chicken Noodle Soup -- gets thick and creamy, unlike those recipes that just add milk or cream. Perfect for a chilly day! *I like to prepare the carrots through parsley the night before and place them in a large freezer bag in the fridge. Then all I have to do the next morning is dump them in and add the broth. Add broth, carrots, onion, celery, chicken, thyme, parsley, salt and pepper to the slow cooker. Cook 7-8 hours on low, until vegetables are tender. Turn slow cooker to high. Add rotini or other pasta, and cook 8-10 minutes until nearly tender. Whisk together milk and flour (make sure all the flour is absorbed -- you don't want lumps!). Stir into slow cooker. Cover and cook about 10 minutes until thickened. Stir. Adjust seasonings to taste. If necessary, combine another 1 cup of milk and ¼ cup of flour and stir into soup if you haven't yet reached the desired thickness. Soup will continue to thicken for another 10-15 minutes after you add the milk mixture. I LOVE how most of you’re recipes are using milk and flour as opposed to cream! Thank you. I can’t wait to try this recipe. I would love to make this but I’ve a couple of questions of you wouldn’t mind? When you say chicken broth is that stock as in the UK it’s something different. Also I’ve just found out I have an intolerance to onion and milk-I’m about to give these up for 1 month – do you think oat milk will be ok to use and that the flavour will be bland without the onion? Broth and stock are pretty interchangeable here, yes. Either will be fine! I think it will be fine without the onion and you can opt to skip the milk or add in oat milk! I’ve never tried oat milk so I can’t say how it will taste. Hi Ashley! Can you freeze the left overs from the recipe? How would you suggest reheating? You can definitely freeze the leftovers, though you have to keep in mind that the pasta will be a little softer after freezing and reheating. I would reheat on low on the stovetop. Hey! Thanks for the recipe, unfortunately i tried to cut down the recipe in half and i think i got all my proportions wrong. My soup ended up tasting like a lot of flour even though i added 1/4 flour and 1.5 cups milk. Sigh! I’m sorry to hear that! It does take some time for the flour taste to cook out sometimes. Did it get better after time? This looks incredible! Quick question, is the 4 cups of diced chicken cooked or raw? Thanks! Sorry — I used cooked chicken, but if you’re cooking it at least 7 hours you can likely use raw. 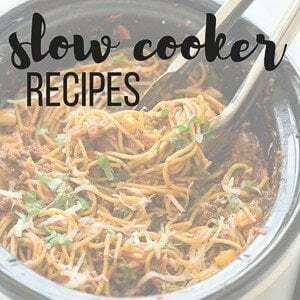 I rely on my slow cooker a ridiculous amount these days, mostly because I’m just too lazy to make supper when that time rolls around! Thanks! 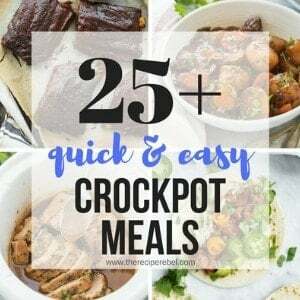 I love slow cooker recipes!! This one sounds delicious… and so perfect for the cooler weather! Yummy! That looks so scrumptious! Perfect comfort food! This is my favourite soup recipe, so good and perfectly warming! Thanks Jessica! It’s definitely one of my favorites too! 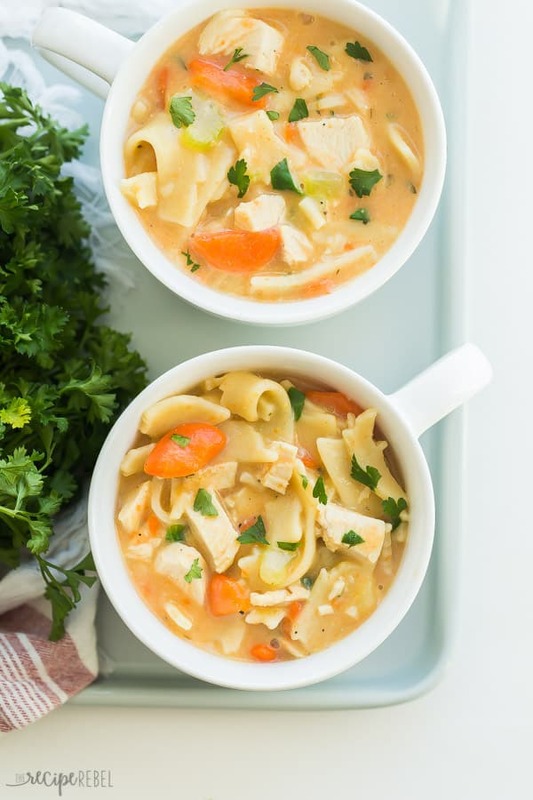 I love soup and chicken noodle will always be my favorite 🙂 This looks so creamy and delicious! I love that you made it in the slow cooker too! Thanks Kelly! Anything I can make in the slow cooker is a win! I love using the slow cooker, it just makes life so much easier. I think dishes are better too when they cook and simmer all day long. I love your version of this chicken noodle soup. Total comfort food! That looks like the best soup! I got hungry reading this, and it’s 10 in the morning! I’ve never thought of making chicken noodle soup creamy but this looks delicious. Pinned! I could eat soup any time of the year, but especially when the weather gets colder, I crave it! I love how creamy this chicken noodle soup is, Ashley! Definitely my favorite flavor of soup. And what a great idea to make it in the slow cooker! Pinned! I <3 Soup!!!! 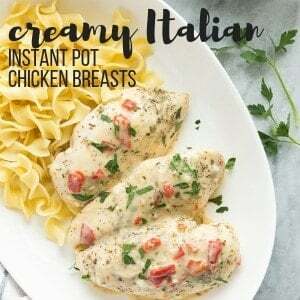 This looks incredible and I love anything that goes in the crockpot! 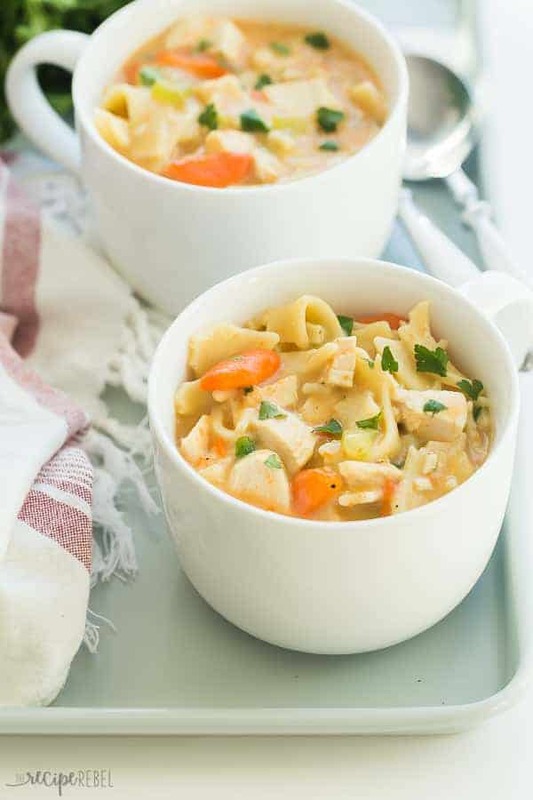 Creamy chicken noodle soup is perfect comfort food! Love that you made it in a slow cooker! Thanks Jessica! 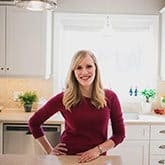 Comfort food and the slow cooker are pretty much my two favorite things!